The World Bank has concluded “Broadband is not just an infrastructure. It is general purpose technology that can fundamentally restructure an economy.”1 Analysis by the World Bank found that in developing economies, every 10-percent increase in broadband penetration resulted in increased Gross Domestic Product (GDP) growth of 1.21 percent in developed economies. 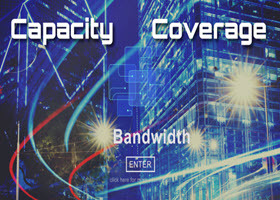 Bandwidth is the fuel of the Giga Economy. Attracting high-tech businesses is crucial to growth plans for many municipal and county governments, and businesses of all types depend on high-speed broadband services and will not consider relocation or new locations unless local infrastructure meets their needs. High-tech companies bring high-paying jobs to a community, which boosts tax revenues for cities and school districts. Fiber optic and cellular connectivity were a specific requirement in the recent huge competition for Amazon’s second headquarters.2 They looked at the overall capability of a city to sustain the demands of their business and their employees. The reality is that by the time a city received this RFP it was already too late to supply the necessary infrastructure if it hadn’t already created the core foundational elements. The finalists have rich fiber-optic and cellular networks operational today and the fundamentals to expand. The Brookings Institute has estimated that “for every 1 percentage point increase in broadband penetration in a state, employment is projected to increase by 0.2 to 0.3 percent per year.”3 Local governments benefit from increased broadband access for many of the same reasons, such as improving communications and efficiency in their own workforce. Adequate wireless access is important for citizens as well. According to the most recent federal survey of wireless substitution, about half of Americans (48.3%) have only cellular phones in their homes, an increase of nearly three percent from the previous year. More than two-thirds of all adults ages 25-34 are living in wireless-only households.4 With half of the population relying solely on mobile networks for everyday communication, including 911 access, these networks are vital. Citizens who have “cut the cord” or have never had landline service can only get dependable wireless service if local infrastructure supports enough coverage and capacity.